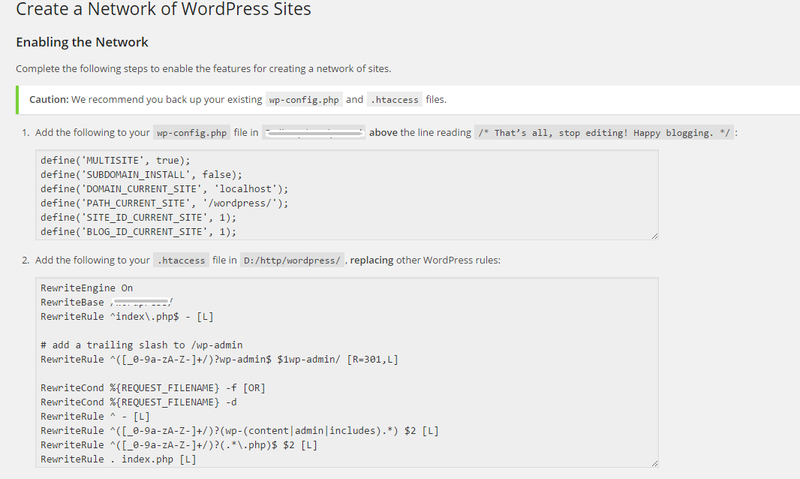 If you are not using a fresh WordPress install for this, then firstly you would have to deactivate all your plugins. Step 1 Open the wp-config.php file and add the following line to activate MultiSite Network option. Before the next step, we need to know the difference between a Sub-domain Multisite and a sub-directory Multisite. and fill in the form. After filling the form you will be directed to a page which asks you to update your ‘wp-config.php’ file with the settings provided there and also shows the Apache Settings to be updated. "/* That's all, stop editing! Happy blogging. */"
Now add the code provided for the .htaccess file.